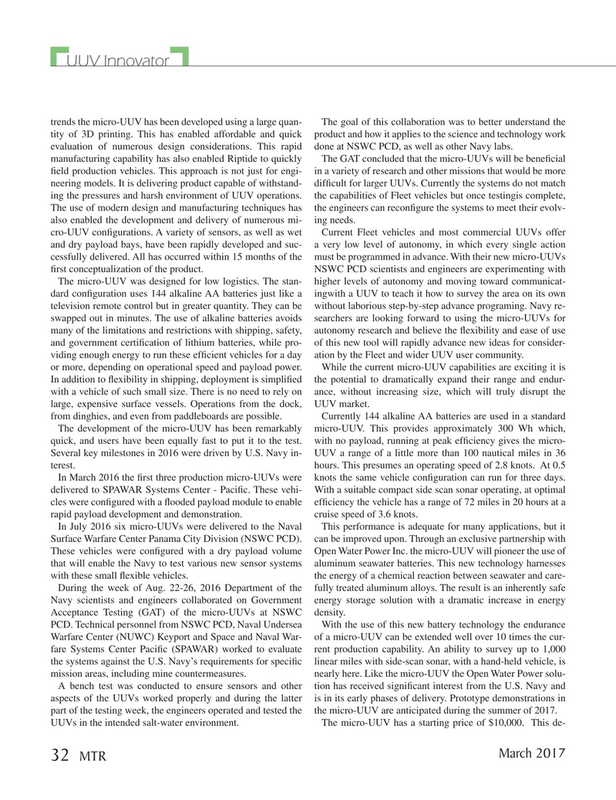 UUV Innovator trends the micro-UUV has been developed using a large quan- The goal of this collaboration was to better understand the tity of 3D printing. This has enabled affordable and quick product and how it applies to the science and technology work evaluation of numerous design considerations. This rapid done at NSWC PCD, as well as other Navy labs. The use of modern design and manufacturing techniques has the engineers can recon? gure the systems to meet their evolv- also enabled the development and delivery of numerous mi- ing needs. The micro-UUV was designed for low logistics. The stan- higher levels of autonomy and moving toward communicat- dard con? guration uses 144 alkaline AA batteries just like a ingwith a UUV to teach it how to survey the area on its own television remote control but in greater quantity. They can be without laborious step-by-step advance programing. Navy re- swapped out in minutes. The use of alkaline batteries avoids searchers are looking forward to using the micro-UUVs for many of the limitations and restrictions with shipping, safety, autonomy research and believe the ? exibility and ease of use and government certi? cation of lithium batteries, while pro- of this new tool will rapidly advance new ideas for consider- viding enough energy to run these ef? cient vehicles for a day ation by the Fleet and wider UUV user community. In March 2016 the ? rst three production micro-UUVs were knots the same vehicle con? guration can run for three days. delivered to SPAWAR Systems Center - Paci? c. These vehi- With a suitable compact side scan sonar operating, at optimal cles were con? gured with a ? ooded payload module to enable ef? ciency the vehicle has a range of 72 miles in 20 hours at a rapid payload development and demonstration. cruise speed of 3.6 knots. Acceptance Testing (GAT) of the micro-UUVs at NSWC density. A bench test was conducted to ensure sensors and other tion has received signi? cant interest from the U.S. Navy and aspects of the UUVs worked properly and during the latter is in its early phases of delivery. Prototype demonstrations in part of the testing week, the engineers operated and tested the the micro-UUV are anticipated during the summer of 2017.